Georgetown, MA Remodeling Contractor | Star Construction Company, Inc.
Star Construction’s connection to the Northern Massachusetts region is long and deep. Our team has over 40 years of experience renovating homes in the area, which means that we’re intimately familiar with the building techniques and unique construction challenges inherent to the region. We won’t shy away from any kind of project or home design, which is why we’re the ideal candidates for your Georgetown repair. From stately Federalist homes to sprawling Victorian ramblers, Georgetown’s architecture has something for everyone. We pay homage to the town’s rich, varied history by building spaces that fit seamlessly within the area’s diverse architectural landscape. Every job in the Georgetown area offers a fresh challenge, as we work to marry different styles and update older materials. The aesthetic complexity is just one of the reasons we love working in the Georgetown region! A great example of this kind of enduring client relationship comes from this Georgetown home. The bathroom remodel pictured above is the third such renovation we’ve performed for this customer. The homeowners have been so pleased with our work that they engaged us for a number of different jobs over the years—everything from fixing storm damage to installing a new heating system. 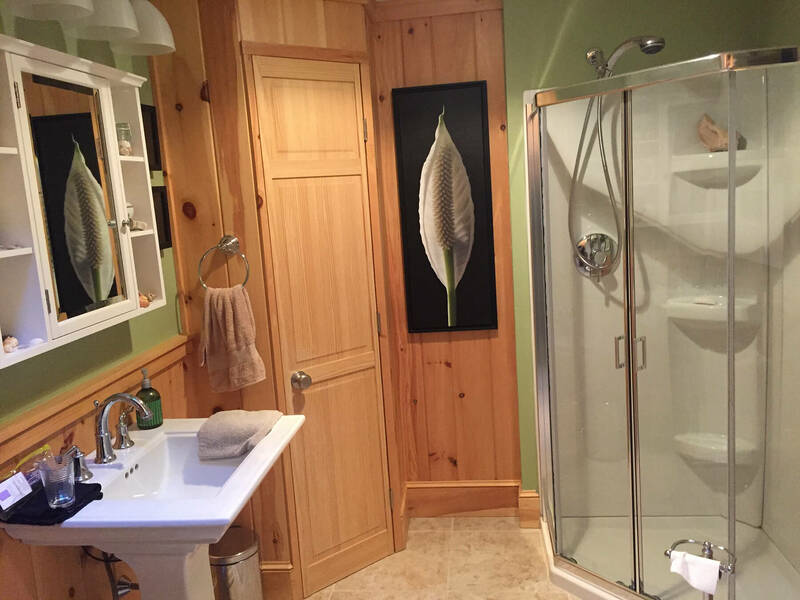 For this project, we completely removed the existing bathroom right down to the framing, replacing everything from the drywall to the wood trim around the cabinets. We added a ventilation system and a four piece shower, along with ceramic tile floor and a pedestal sink. The homeowner, a photographer, converted the finished walls into a sort of makeshift gallery to display his work. As a first-floor bathroom, it’s also makes a comfortable space to accommodate guests when the homeowners have visitors. This room is typical of our Georgetown projects. Because of the high number of historical homes in the area, we’re often called in to modernize existing spaces and update them with today’s fixtures and finishings. It’s all part of the challenge of blending older styles and new aesthetics and innovations to bring new life into a space. And we’re up to the task! At Star Construction, we take all our projects personally. That’s why we work closely with our customers to develop lifelong relationships—some people might even call them friendships! Our expertise in the Georgetown area gives us the home team advantage: we’re able to make quick, region-appropriate decisions for your local home, without sacrificing those custom touches that make your space so special.